There is a passage in Proverb that reads, “We make a living by what we get; we make a life by what we give”. 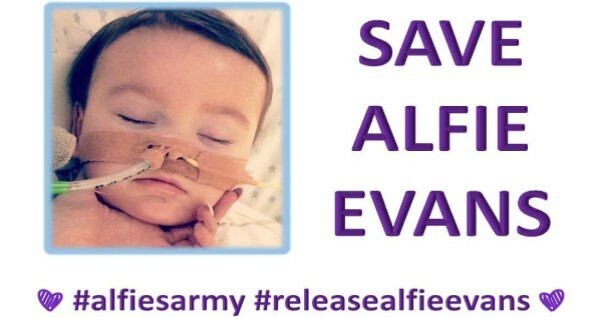 Little Alfie Evans never got the chance to make a living and the only thing he did get out of life was the love of his parents, Tom Evans and Kate James, and the millions of people across the planet who stood up and voiced their outrage at a heartless and callous British universal health care system and those who follow it to the letter, even if it means denying a parents rights to give their son a chance to live. Alfie Evans was 23 months old, and born with a rare degenerative neurological condition that resulted in a semi-vegetative state. The toddler while at home began experiencing seizures; his parents brought him to the Alder Hey Children’s Hospital in Liverpool in 2016. While on life support, in December 2017, doctors determined that continuing this course of treatment was not in the best interests of Alfie. The hospital thought it best to discontinue any further life saving procedures, and by removing oxygen and nourishment would allow the child to succumb and pass on. Alfie’s parents disagreed, and upon receiving an invitation from the Italian government, which would shortly thereafter grant Alfie Italian citizenship, requested he be transferred to Bambino Gesu Hospital in Rome for further care. The hospital is affiliated with the Vatican and made the offer to Alfie’s parents; it was stipulated that other procedures might help Alfie and prolong his life. The matter eventually wound up in court; the Alder Hey Children’s Hospital sought a declaration that to continue ventilator support was not in Alfie’s best interests, and that scans had revealed “Catastrophic degradation of brain tissue, and that further treatment was unkind and inhumane”, and under these circumstances “unlawful”. The High Court’s Mr. Justice Hayden presided over the case on December 2017. After listening to the arguments of both parties, Alfie’s parents and Alder Hey Hospital, Judge Hayden advised all concerned that if an agreement could not be reached, he would render a decision on what he determined was in the best interests of Alfie. On February 20 Justice Hayden issued his decision to allow doctors to end life support for Alfie, and on April 13 endorsed an end-of-life program remarking the child deserves “peace, quiet and privacy”. Alfie’s parents, still hopeful, took their case to the Court of Appeals and Supreme Court, both of which upheld Justice Hayden’s decision, as did the European Court of Human Rights. On April 18, Alfie’s parents flew to Rome and met with Pope Francis who supported the parents in their effort to keep their son alive. The Pope spoke out and renewed a previous statement he made that the “appeal that the suffering of his (Alfie’s) parents may be heard and that their desire to seek new forms of treatment may be granted”. The Italian Ministry of Foreign Affairs granted Alfie citizenship thinking this would allow his transfer, however it did not. Texas republican Senator Ted Cruz expressed his opinion on social media, “Systems of socialized medicine like the British National Health Service (NHS) vest the state with power over human lives, transforming citizens into subjects”. The senator’s comments were met with some derision, a British barrister, Matthew Scott responded, “Had the Evans family lived in America, it is unlikely that Alfie would even have survived as long as he had, unless of course they had the money or insurance to pay for the pediatric intensive care that has kept him alive for months”. This tragic situation has created a dilemma that a just and merciful society must face when confronted with this kind of heartbreaking decision. Many were quick to point out the hazards and pitfalls of universal health care that is the British system, and that gives equal, if not greater rights, to the state and the doctors over that of parents or legal guardian. As a reminder there was a similar case in Britain, Charlie Gard, the 11th month old who was taken off life support and passed away last year. We can go back and forth, point fingers, criticize and decry how other countries deal with this matter, but should not the parents have absolute rights and determine what is best for their child. And yet there are instances where emboldened, courts will step in and challenge the rights of parents when an impasse is reached and a decision must be made. Consider there have been instances when courts have overrode parental rights, as an example here in America there have been cases where courts have ruled and allowed doctors to give blood transfusions to children against the beliefs of their Jehovah Witness parents. I believe Alfie Evans parents, the mother and father that gave him life, should have been allowed to give their son another chance to live, and move him to Bambino Gesu Hospital in Rome. Many will say, like the British decision makers, there was no hope, but I also believe in miracles. Perhaps our only hope in dealing with these life and death issues is that someday soon great minds in medical research will have developed the cures and remedies to absolve societies from having to make these dreaded final decisions. Rest in peace little Alfie, you’re home.